We’d love your help. Let us know what’s wrong with this preview of Human Resource Management in Higher Education. Analysis. by Attila Pausits. Human Resource Management in Higher Education. Analysis. This e-book is a selected collection of student papers on the course ‘Human Resource Management in Higher Education’ in MARIHE program. The course ‘Human Resource Management in Higher Education’, led by Attila Pausits with contributions from Hans Pechar and others, aims to enable students to: 1) understand the theoretical foundations and the strategic role and practical in This e-book is a selected collection of student papers on the course ‘Human Resource Management in Higher Education’ in MARIHE program. The course ‘Human Resource Management in Higher Education’, led by Attila Pausits with contributions from Hans Pechar and others, aims to enable students to: 1) understand the theoretical foundations and the strategic role and practical instruments of HRM in HEIs 2) to assess the strategic role of HRM in HEI and 3) to implement some of the most crucial instruments of HR management in their specific institutional context. Through guiding students’ self-learning and group-work, lectures and workshops, the course introduces the HR context in HEI – extent of institutional autonomy for HR decisions in HEI in labour market conditions, discusses the current challenges of HR management in Europe and the dimensions of HR, analyses the instruments and methods of strategic HR management, manpower planning, staffing and workload targets, staff recruitment, staff development and appraisal of performance, provides an introduction into the structures, roles and responsibilities for HR management and also into the contracts, remuneration and incentives generally used in this field. (MARIHE; 2014). To ask other readers questions about Human Resource Management in Higher Education. Analysis., please sign up. Be the first to ask a question about Human Resource Management in Higher Education. Analysis. This E-book is the second from the MARIHE e-series, Erasmus Mundus (Erasmus+) MA Programe of Danube University Krems (Austria), University of Tampere (Finland), University of Applied Sciences Osnabrück (Germany), Beijing Normal University (China). The selected course papers included in this e-book provide important perspectives of HRM concepts and functions in HEIs. The discussion of diverse experiences, contexts prov This E-book is the second from the MARIHE e-series, Erasmus Mundus (Erasmus+) MA Programe of Danube University Krems (Austria), University of Tampere (Finland), University of Applied Sciences Osnabrück (Germany), Beijing Normal University (China). 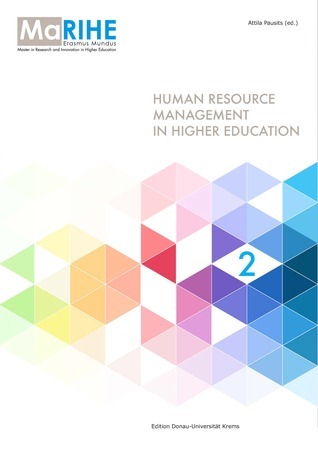 The selected course papers included in this e-book provide important perspectives of HRM concepts and functions in HEIs. The discussion of diverse experiences, contexts provide insights from various corners of the world. The e-book hence is structured in the following manner. The first six chapters focus on specific HRM concepts and theoretical questions, while the following four chapters allow the readers to gain a deeper insight into the functions of Human Resources Management in Higher Educational Institutes.